40 Kg. & 50 Kg. 1 Layer Mash 50 Kg. 2 Broiler Starter 50 Kg. 3 Broiler Finisher 50 Kg. 4 Sheep feed 50 Kg. 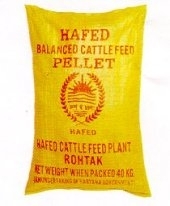 1 Cattle Feed Pellet Ordinary. 50 Kg. 2. Cattle Feed Pellet Rajasthan. 50 Kg. 3. Cattle Feed Pellet Vita Brand. 50 Kg. 4. Cattle Mash Special 40 Kg. 5. Pusha Mash Special 50 Kg. 6 Pig Feed 50 Kg. 7 Poultry Feed 50 Kg. 8. Creep Ration 50 Kg.